Absolutely georgeous are these 24" tall handmade beeswax pillar candles. They will complement your fireplace hearth or any occasion for which you might use them. 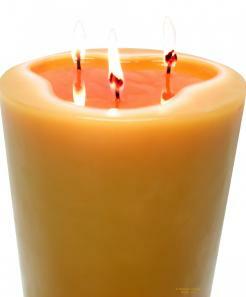 Only 100% pure natural beeswax is used in all of our pillars and candles. You will not find any other waxes being used in the making of BeeswaxCandleWorks.com candles. We purchase our beeswax right from USA beekeepers! Our 24" x 4" 100% beeswax pillar will make an awesome addition to your fireplace hearth!